Welcome to Reader Girls. 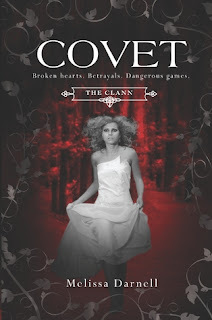 We host the Covet Blog Tour today. The Clann is one of our favorite paranormal YA series and we are ecstatic to be a part of this tour presented by Kismet Book Tours. Author Melissa Darnell has provided us with a guest post on the topic we sent her, we post our review, and there's a tour wide giveaway to enter. Dangerous to be together. Painful to be apart. Savannah Colbert knows she broke up with Tristan Coleman for the right reasons. Most of all, to keep from killing him with her new vampire abilities. But try telling her heart. Now, lost in a sea of hostile Clann faces, Sav tries to come to terms with what she’s becoming and what that means for her future. And that someone is doing their best to bully her into making a terrible mistake. A reckoning is coming…and not everyone will survive. especially for the YA market? What’s NOT to love about forbidden love? It’s a situation that puts you into the perfect conflict of the heart...choosing between your family and your possible soulmate. Do you make your family happy by abiding by their rules and thereby continuing to earn their trust, but sacrifice being with the one you love? Or do you take the chance of getting caught, betray your family’s trust, and see where the forbidden road to love might lead you? What if the romance fizzles out or was never real to begin with? Is it worth the risk anyway? Worse, what if your family has very solid and logical reasons for forbidding you to date that person, including the danger you pose to that person and the threat of starting another worldwide war if others find out about your illicit relationship? Would it be better to simply stay away from that person and hope you’ll find true love with someone else? Could you live with the regrets and “what if’s” that would come as a result of making that sacrifice? That is what you face with forbidden love. And forbidden love is never as strong a conflict as when you are still a teen living at home with your family and required to follow your family’s rules! 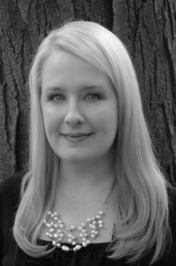 Melissa Darnell is the author of a growing list of adult and YA fiction and nonfiction books. Born in California, she grew up in Texas and has also called the following states home since then: Utah, West Virginia, Louisiana, Alabama, Kentucky, Iowa and South Dakota. She currently lives in Nebraska with her husband Tim and two children, Hunter and Alexander, where she enjoys watching Whale Wars, Glee and True Blood, designing digital graphic products for the virtual world of Second Life, and of course writing her latest book. For information about her other books, please visit Melissa’s website at www.melissadarnell.com. I enjoyed Crave (my review) but I have to say, I was not prepared for how much I would LOVE Covet! Catching up immediately where Crave ended, Tristan and Sav are on their way back to Jacksonville, Texas, after Sav is tested in front of the Vampire Council. Tristan has no idea of the promise Sav made to keep him protected, nor that their time on the plane will be their last. Heartbreak, responsibility, maturity, these two have changed from the innocent and sweet teens from the first book. Sav is unbelievably hard on herself, more so after tragedy befalls her family and Tristan is fiercely determined to get her back. There are some powerful, tender moments throughout Covet. Sav and Tristan may be compared to Romeo and Juliet but Shakespeare's couple only had to fear misunderstanding and a lack of communication. The young lovers in Covet have to deal with Sav and her bloodlust for Tristan, and then the mysterious murders of Clann members. This second installment is tense, full of surprises, some neat twists, and has Sav moving in with her vampire dad to help with her 'change.' Fast-paced, I became a speed reader, eating the words as I raced to see what happened next. If Covet is so good, what can we expect in the next book? "I kissed him, parting his lips, purposefully deepening the kiss past sweetness straight into mind-wrecking loss of control. His energy poured into me, a heady rush of power that sang through my veins like liquid lightning. He moaned into my mouth, and even his breath was food. I didn't even have to work for it. All I had to do to drain him was kiss him. There was no internal on and off switch, no controlling the flow of energy from him to me. I was an endless, bottomless cup that would take every drop of his life until he was gone. And there was nothing I could do to change that ability. He staggered backward to the wall, pulling me with him. And still we kissed, his fingers spread wide over my back, mine threaded into the soft, unruly curls at the nape of his neck. His heart pounded against my chest, its rhythm slowly growing fainter. I was killing him. And part of me didn't want to stop." Cover comment: Like I said in my review for Crave, I am not a fan of this cover either. I would really like to read this book, the story sounds very interesting. I do agree however that I am not a fan of this cover. Crossing my fingers for you to win! I seriously cannot wait to read this! I'm amazed at how much readers who loved Crave were even more crazy about Covet. And Melissa's right about the appeal of forbidden love. Count me in that bunch! Covet grabbed me even more than Crave. Happy reading! forbidden love stories are my favorite! it adds a dangerous element to the story. That is probably why I love PNR and Urban fantasy. We thank Harelquin Teen for the giveaway. Hope you get the opportunity to read Crave! Thank you so much for the giveaway. I've heard great things about Melissa and her book. Thank you to Melissa and Harlequin Teen. We're so glad you stopped by! We also want to thank Harlequin Teen and Melissa Darnell for everything (and Kismet Book Tours). I love the cover for Covet - the way that the vines create a frame is beautiful! Thank you for having the giveaway! Glad you love the cover! Good luck with the giveaway! Very nice review and excerpt. Glad you stopped by the tour and thank you for your kind words. 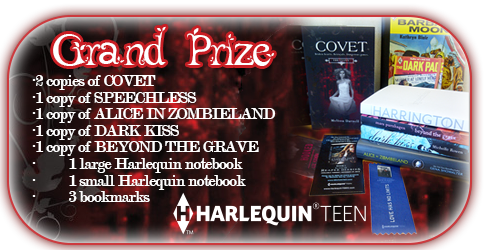 We agree, that's some giveaway Harlequin Teen put together. Thanks for stopping by and commenting. The post is amazing ! I love the book that Melissa Darnell wrote ! I hope I will have the chance to read it ! Thanks for commenting. We hope you get a chance to read Melissa's book too! We have to thank Harlequin Teen--that's an awesome giveaway! I have Crave but haven't read it yet. It, as well as Covet, definitely sounds amazing. Plus, who doesn't like the allure of forbidden love! Thanks for hosting this tour and giveaway!